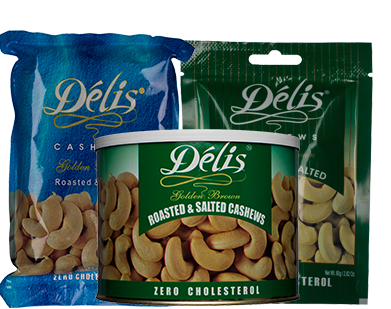 The Delis Range is catered to those who prefer traditional taste of oil roasted cashews. The cashews are roasted to a perfect Golden Brown in Vegetable oil. Flavours available are: Golden Brown, Malabar Masala, Masala Seasoning, Sour Cream Onion, Tangy Tomato. Delis Brands, cashew nuts are roasted in oil, for those who relish the traditional oil roasted taste. Available in various flavours. Completely healthy and totally cholesterol free. Order Now and Get the Best Quality Cashews online.